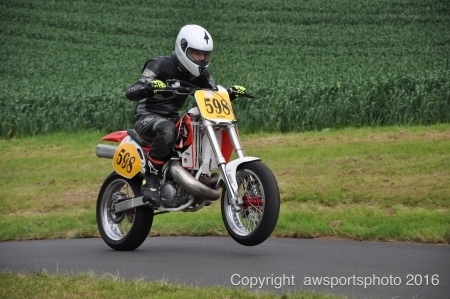 Sunday 23rd April brings the riders in the National Hill Climb Association’s motorbike championship to Gurston Down Speed Hill Climb. This will be their first visit of the season. There will be thirty motorbikes, six side-car combination and a trike too, there will be two, three and sometimes one wheeled action. 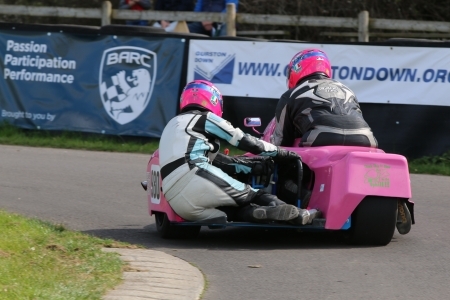 All of them will pit their wits against the fast and twisty course at Wiltshire’s famous Speed Hill Climb Venue. They will also be competing against each other too, of course.There will be four wheeled action too. Check the Sunday 23rd Meeting Preview for more details. Spectators have superb and unrivalled access to the hill, paddock and facilities. We have excellent catering and refreshments on site too. 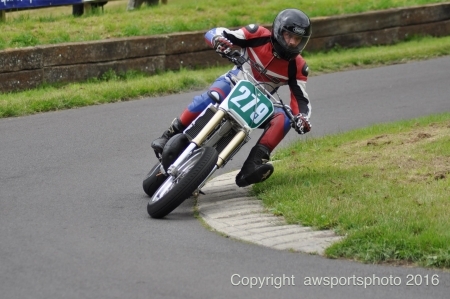 In the Solo Motor Cycles 100cc to 250cc class, has eight entrants. It’s a little difficult to predict who is in form this season as the Gurston event is one of the first. The course record for this class is 34.08s, which is fast even by four wheel standards. There is a big entry in the Solo Motor Cycles 351cc to 500cc class. Chris Keates (Honda CRF) and Richard Bowker (Honda CRF) and Pete Ford (KTM) all have previous form on the hill so we should expect a very close fought class. Last year the top four were within one second of each other. The class record is 32.33s. The Solo Motor Cycles 501cc to 750cc class has six entries. 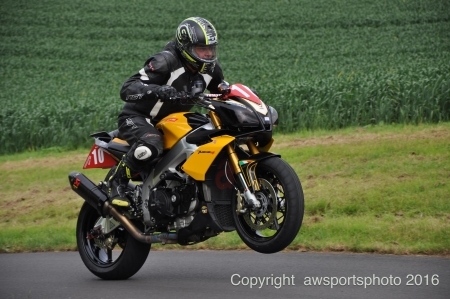 Mark Short and his Aprilla SXV 550cc took the win last year on 35.28s. With Tommy Hodges (KTM SMR), Peter Short (Aprilia SXV), Guy Ursell (KTM), Keith Haines (Aprilla) and Dan Hurley (Husaberg) competing, this class will be close. All these riders have Gurston experience! 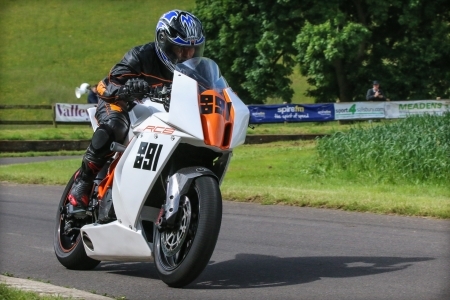 The Solo Motor Cycles 751cc to 1300cc class sees Peter Jeffery on his KTM RC8 1148cc bike, last years winner, up against Stuart Mills (Aprilla) who finished second last year by just 0.3s. This class will be close. If you thought the solo motorcyclists were balmy, wait until you see the side-cars! The rider and pillion race up the hill, the rider laying on their front and the pillion hanging on or sometimes out of the combination! There are no seat belts or restrains to keep them all together! The Side-Car class has five combinations entered. 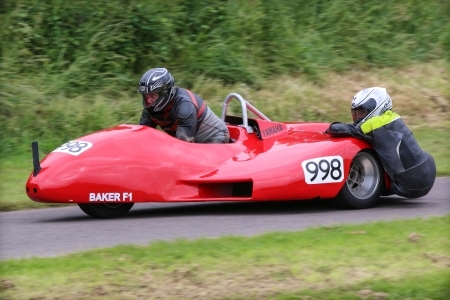 Last years winners and hill record holders, Patrick and Paul Keates in the Baker F1, probably start favourites. But they won’t have it easy. 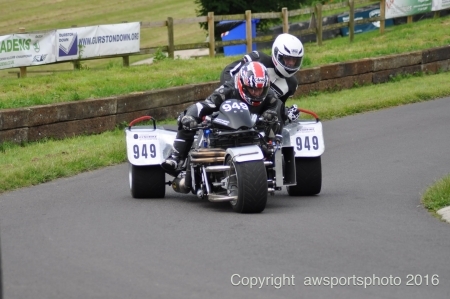 Sam Matthewman and Gareth Rawlings take to the hill on a trike. If you check our facebook page you’ll find a video of the trike competing last year. The bike meeting closed with a Top Ten Run-off. Paul Jeffery won last years but with more than thirty contenders for these ten places, there is likely to be some great riding. 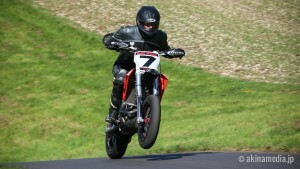 With this variety of bikes (and cars) Sunday, April 23rd will be an action packed day at Gurston Down Speed Hill Climb. Times: Competition from approx. 1300, practice from 0830 both days. Admission: Only £10 for adults each day, accompanied under 14s free, free paddock entry, free parking.